Place 6 eggs in a saucepan of cold water and set over a high heat. Bring to a boil, then cook for 6 minutes. Turn the heat off and let stand for 2 minutes. Chill under cold running water, then peel and halve. Set aside. Set a large saucepan over a high heat and fry the chicken thighs in olive oil for 5 minutes, turning often, until lightly browned. Set aside. Add the leek, celery, carrot, capsicum and garlic to the saucepan and fry for 5 minutes, until just softened, then return the chicken and mix in the Moroccan seasoning. Pour in the chicken stock and bring to a boil, then turn the heat to very low and simmer gently for 30 minutes, until the chicken is tender. 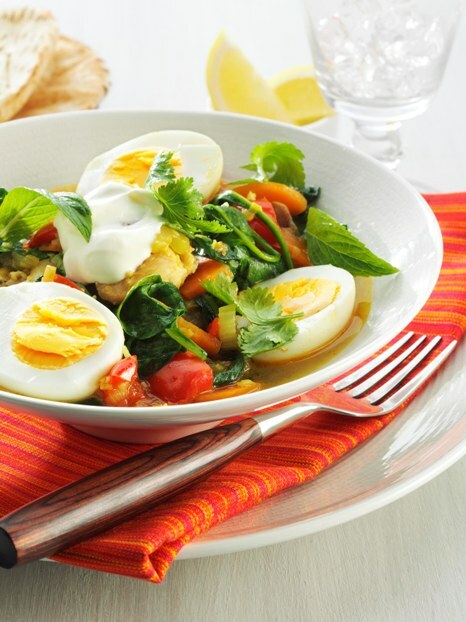 Mix in the eggs, spinach and herbs, then serve with low-fat yoghurt, flatbread and lemon wedges.